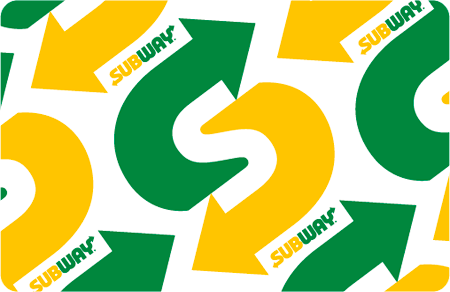 SUBWAY® Cards…the perfect incentive and motivational reward for all your corporate and fundraising needs! With a focus on fresh ingredients, affordable prices and an extensive menu of made-to-order sandwiches; SUBWAY® restaurants have become the leading choice for people seeking quick, better for you meals that the whole family can enjoy. Having SUBWAY® Cards means always having a delicious meal right in your pocket. With more than 30,000 convenient locations across the U.S. and Canada, there are more SUBWAY restaurants than any other quick serve restaurant brand in North America. How far are you from SUBWAY restaurant? Find out. The perfect gift for any kind of program! Yes, the minimum order is $2,500. Q. Are there discounts available for bulk gift card purchases? Yes, volume discounts are available based on annual volume. Non-denominated gift cards are available and can be loaded from $5-$500. Yes, your order can include mixed denominations. You can pay by company check, wire transfer, or ACH at time of order placement. Orders are shipped via FedEx Ground Service within 5-7 business days of payment receipt. Gift cards are shipped in bulk to a single location. Fees apply to expedited shipping. No, SUBWAY® Cards have no expiration dates. No, SUBWAY® Cards have no dormancy fees or other fees. No, gift cards are not redeemable for cash except where required by law. Q. Where can gift cards be redeemed? SUBWAY® Cards can be redeemed at more than 30,000 locations across the U.S. and Canada. SUBWAY® Cards Terms: Protect This Card Like Cash! Value Pay Services LLC can only replace remaining balances on lost, stolen or damaged Cards if your Card is registered online at www.mysubwaycard.com. This reloadable SUBWAY® Card is issued by Value Pay Services LLC and never expires, nor do we charge any fees. This card is not redeemable for cash except as required by law. SUBWAY® Reward points expire after 36 months, unless stated otherwise by us. Only valid at Participating Restaurants; visit www.mysubwaycard.com for complete terms and conditions. Use of this Card constitutes acceptance of these terms. Check your balance at www.mysubwaycard.com or call 1.877.697.8222.